Mayor Sandy Stimpson and the Mobile City Council continue with mediation, according to court records, following the filing of a lawsuit over which branch of municipal government has control over executing contracts. 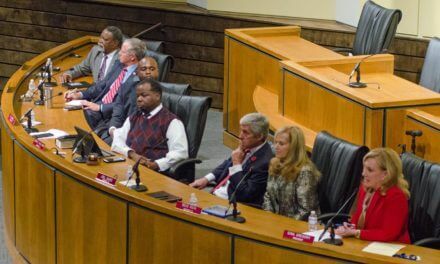 Neither councilors nor members of Stimpson’s administration have officially commented on the progress of the mediation since Judge Michael Youngpeter ordered it in late December. Lagniappe has examined records related to the attorneys hired in the case. Two different records requests suggest as many as 10 attorneys are working on the case from both sides. The council has hired four and Stimpson’s office has hired five. The council has hired Jarrod White for $200 per hour, Donald Stewart for $200 an hour and Archibald T. Reeves for $200 per hour. Council attorney Wanda Cochran is also working the case at a $150-per-hour rate. While White, Stewart and Cochran are the attorneys for Council Vice President Levon Manzie, Councilman Fred Richardson, Councilman C.J. Small, Councilwoman Bess Rich, Councilman John Williams and Councilwoman Gina Gregory, Reeves was hired in December to defend Councilman Joel Daves separately. It’s unclear how many hours he has worked on the case, but court records indicate he has filed a response to the lawsuit on Daves’ behalf. Following the Dec. 18 meeting in which Reeves was hired, Daves defended the decision in a statement. Stimpson has six attorneys working the case, including city attorney Ricardo Woods. Attorneys from Woods’ firm Burr & Forman are also working on behalf of the plaintiff. Attorneys H. William Wasden and Christopher Burkholder work with Woods at the firm/ The other three attorneys working for Stimpson are from Cunningham Bounds. George Finkbohner III, Steven L. Nicholas and Joseph Steadman all work at the Midtown firm. Despite the large number of attorneys on the plaintiff’s side, city spokesman George Talbot said the legal costs have been “minimal” because most of the costs are included in the city’s legal contract with Burr & Forman. Also, two of the three Cunningham Bounds attorneys are working on the case for free. Stimpson did not provide hourly rate information by press time. Youngpeter assigned the case to mediator Michael Upchurch, according to court records. Upchurch’s fee was not included in the mediation order. Stimpson filed the lawsuit after the City Council voted to rehire a communications specialist he had previously fired. In rehiring the specialist, councilors said they believed the firing was politically motivated.